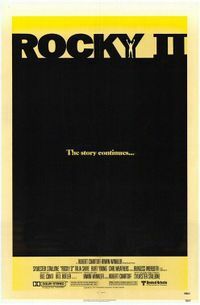 Rocky II was the 1979 sequel to Rocky, a motion picture in which an unknown boxer had been given a chance to go the distance with the World Heavyweight Champion. Sylvester Stallone, Carl Weathers, Burgess Meredith, Burt Young and Talia Shire reprised their original roles. After their championship bout, Rocky and Apollo are taken by ambulance to a hospital, where they meet once again in the emergency room. Apollo Creed, who retained the championship on points, is angry at Rocky, the first man to go the distance with him, and starts clamoring for another chance to knock Rocky out. Rocky goes to Apollo's room that night and asks "Did you give me your best?" to which Apollo answers "Yes". Rocky declines talk of a rematch and tells Apollo that he is quitting boxing. Rocky's decision to retire is strengthened when doctors tell him he needs surgery for a detached retina. Following his hospital stay, Rocky begins to enjoy the profits from his fight with Apollo. He buys his first car, marries Adrian, and buys a two-story house. For money, Rocky opts to exploit his image as the "Italian Stallion" by appearing in commercials. His new career, however, is quickly derailed by his subpar reading skills, which lead to a clash with the director of his first commercial. Unable to find white collar work due to his lack of education, and after being laid off from the meat plant where Paulie previously worked because of cutbacks, he gets a job as a boxing trainer at Mickey's gym. Adrian, now pregnant, returns to her old job at the pet store. Creed, who has been receiving hate mail about his win over Rocky, elects to pressure Rocky into another fight so that he can prove himself. Rocky begins to have second thoughts about the fight, because of the pressure applied by Apollo. Rocky decides to accept the challenge and begins training. Mickey wants Rocky to learn to fight right handed in order to better protect Rocky's bad eye, and to give him a surprise advantage by switching back to left handed with the intention of throwing off Apollo's timing and confusing him. However, Adrian's opposition saps his resolve and his training suffers. When Paulie confronts Adrian about her opinion, her angry reaction creates a serious medical condition that breaks her water prematurely. During the birth of their son, Adrian falls into a coma and Rocky breaks training to spend every waking moment at her side, not even seeing his newborn son until she recovers. When Adrian emerges from the coma, she tells Rocky to "win" and he restarts training in earnest with Mickey for the rematch with Apollo. His conditioning improves dramatically with increased strength and speed. Rocky and Apollo once again fight an intense battle in front of a standing-room-only crowd at the Philadelphia Spectrum. Apollo gets off to a fast start, flooring Rocky twice in the first round and building a huge lead on the scorecards as the fight goes on. At the start of the fifteenth round, Apollo's trainer begs him not to try to go for a knockout, as he can win simply by avoiding Rocky; Apollo, not wanting another questionable victory and frustrated that Rocky keeps coming back, disregards the advice. Mickey tells Rocky to switch back to boxing left handed now, and although Rocky initially refuses, he switches back, landing several crashing lefts. Rocky hits Apollo with a final punch that knocks him down, but from sheer exhaustion, Rocky also goes down to the canvas. The referee starts the final ten-count as the fighters struggle to their feet. As a beaten and exhausted Apollo slumps to a corner, Rocky grabs the rope and picks himself up at the count of 9, and is declared the new World Heavyweight Champion. In the post-match interview, he thanks Apollo for another hard-fought battle and Mick for training him before shouting, "Yo, Adrian! I did it!"